Question: How to sync iTunes movie to PSP for playback? I have collections of movies purchased from iTunes and what I want to try is to sync those iTunes movies to my PSP and enjoy them. But I got failed in that. Is there a way to convert the iTunes movies (.M4V) to a PSP friendly format? Answer: Being protected by DRM, iTunes movies can't be transfered to other devices except for Apple devices. If you want to put them on PSP, you need to remove the DRM protection first, and then convert iTunes movies to PSP mp4. What you need is a third-party software which can help you remove DRM protection at first. 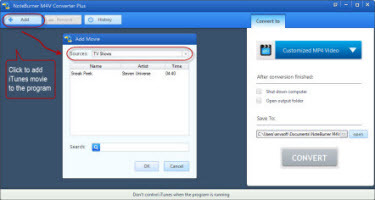 NoteBurner M4V Converter Plus (For Mac & For Windows) is just a powerful iTunes DRM video converter which can help you easily get rid of Apple's DRM protection from those iTunes M4V movies. Besides, it is also converts iTunes M4V to various video formats like MP4, MOV, AVI, WMV, MPEG-4 and so on. This article is going to show you how to sync iTunes videos to some portable game devices like PSP so that you can enjoy iTunes videos on these devices freely. 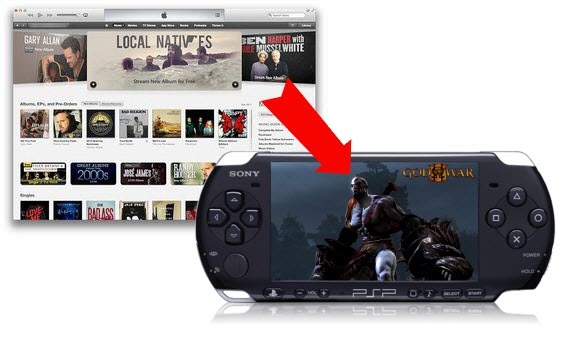 Guide: How to remove DRM and convert iTunes M4V movie to PSP? NoteBurner iTunes M4V to PSP converter not only supports convert iTunes purchased movies, but also supports convert TV Shows and music videos purchased from iTunes Store. Click the add button and then import the M4V video resources to the program from iTunes library. One of the best formats for playing on PSP is MP4. NoteBurner DRM M4V to PSP converter provides particular profiles for PSP. Just click the profile button and then you will find get the profile menu. You are suggested to choose Sony PSP MPEG-4 AVC Movie (*.mp4). After all the settings done , you need click the convert button to start to convert iTunes M4V to PSP MP4 video. Once the conversion completed, freely click the location button to find the converted video files. After that, you can directly transfer and play the MP4 movie PSP for smoothly playback.